Surface temps at 57.3 degrees. Cool brisk fall mornings have surface temps in full retreat, and combined with the shorter days, have given the signal to the Brown trout population that it's time to start this seasons spawn activity. 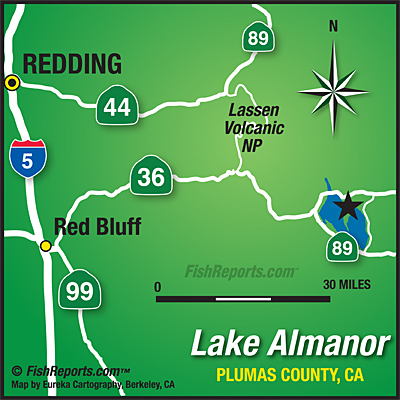 Almanor is quiet now and fishing pressure is light. Trees are showing their fall colors, and so are the big browns of Lake Almanor. Generally some of the best fishing is right now as hens prepare the nest, the big males are close by. Usually loners, adult males, will move into these nesting areas in larger concentrations. Territories are marked off and enforced, intruders are often chased away as skirmishes are no doubt happening below. Larger rainbows also lurk nearby looking to feed off the spawn, as lots of egg material will be about. The smaller rainbows are in fear of the larger browns but with all the food about, it makes them just a little braver. This time of year we see more fish tipping to pickup eggs that are floating around the lake bottom. Salmon eggs with a small round split shot, thrown out, and worked slowly back to your boat or shoreline, is a good method. Also white jigs bouncing around a nest will probably get aggression hits from males or nesting hens. Hens need to be released and the males are great for a photo or two, but should be released also, besides the meat is not that great to eat during the spawn anyway..And try not to use a net. It's the big Rainbows that are good to eat and they will be around all spawn activity looking for a free meal. Trolling has still been very effective, but the fish are running on the small side, mostly because there have been several big plants in the last 30 days, small fish are everywhere. Most have been in the 10" to 15" range, and a few over 2 lbs. from time to time. Silver Needlefish, Red and gold Speedy Shiners are popular and easy to find trolling lures. If you can get a red and gold "Seps Pro Secret", run it 8 to 10ft. down and 180' back at 2.4 mph and KaPow! Trollers with downriggers... set your releases light, there's lots of juvenile salmon around and they will not have enough body girth to pop them, and you could drag one around and not know it..
As we move toward winter, water clarity will begin to deminish and attractors are helpful. Dodgers and crawlers have always been a good approach. Size 04 UV treated dodgers (Rasberry) down deeper have been a favorite of mine, while other anglers are also using flashers to help overcome the clarity issues.